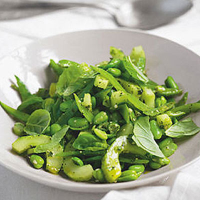 This fresh, crunchy salad provides a clean-tasting contrast to the other dishes. Mix the ingredients and dressing separately and toss together just before serving. Bring a large saucepan of water to the boil and cook the mangetout for 1 minute. Drain with a slotted spoon and rinse in cold water. Add the broad beans to the saucepan and cook for 3 minutes. Drain. Peel the cucumber and halve lengthways. Scoop out and discard the seeds with a teaspoon. Slice the cucumber halves very thinly. Roughly shred the mangetout into a large salad bowl. Pop the beans out of their skins and add to the bowl, along with the cucumber and salad onions. Tear the basil into small pieces, discarding the tough stalks, and add to the bowl. Beat together the oil, pesto, vinegar and seasoning to taste and drizzle over the salad. Toss the ingredients together before serving.